Today we’re eating out in the province of Murcia in Spain. Murcia is a large agricultural area that is known as the orchard of Europe. Fruit and vegetables seem to grow everywhere and are delicious in their freshness (the local markets are a real joy). And as we’re by the sea, fish and seafood are plentiful and often straight out of the water into the restaurant and then onto your plate. Plus the local meat is full of flavour. So with that as a basis, what is probably the best restaurant in the region is bound to offer up serious delights. 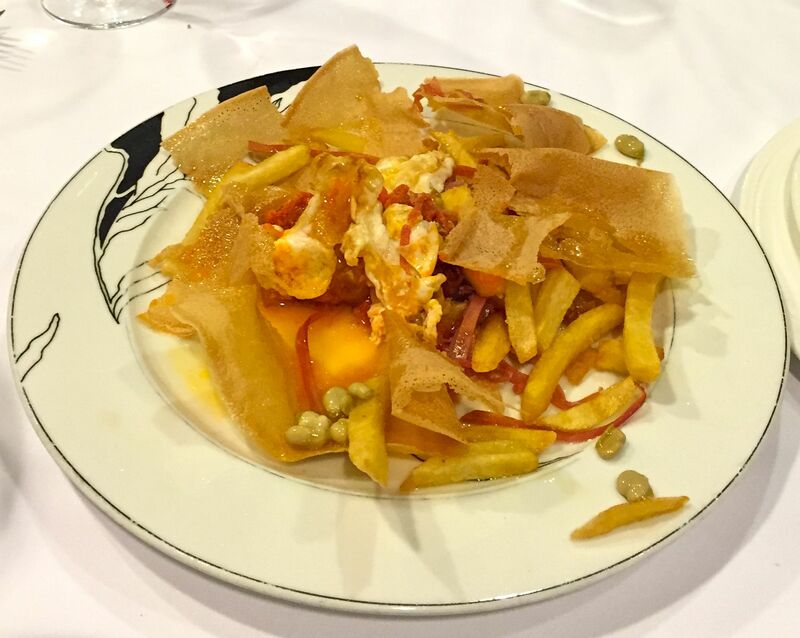 The menu is comprehensive and split into sections including starters, cod dishes, paellas, meat dishes, seafood. This doesn’t seem to make it any easier to choose, as you page through the book of tantalising offerings. As if to make it easier, some of the dishes, like the croquettes and empanadas can be ordered by the unit. What a great idea, choose one of everything, I’m picturing a whole plate of tasty morsels encompassing the flavours of Spain. 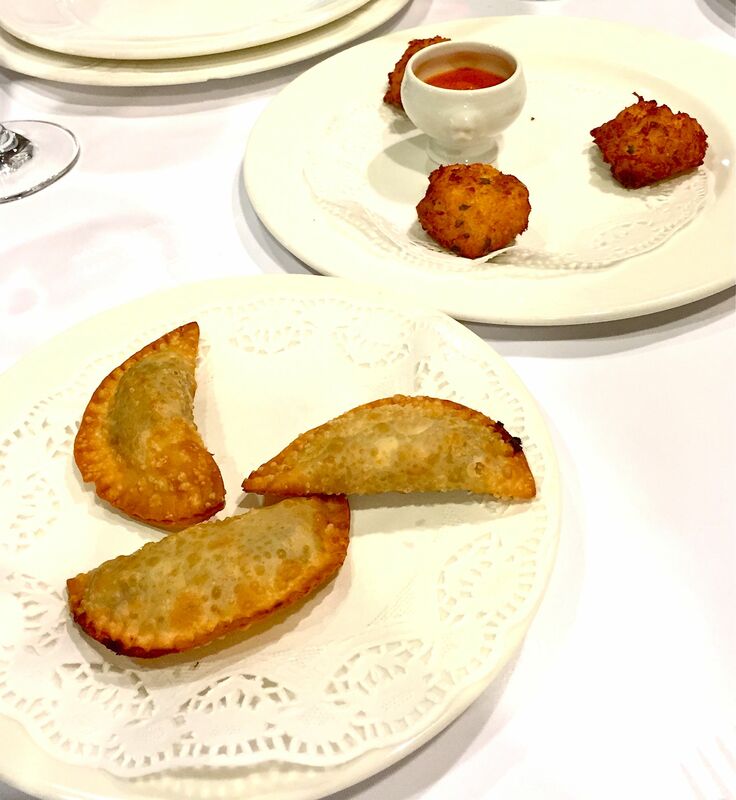 Today we tried the halibut croquettes which were beautifully soft, creamy and lightly fishy and the beef empanadas, succulent filling encased in the lightest of crunchy pastry that melted in the mouth. Off to a good start! The Spanish do love their pigs (especially for dinner) and are famous for eating nose-to-tail. I’m not so good with some of the offerings (ears and tails aren’t among my faves) but am always waiting to tuck into something tasty like these local pork chops. So amazingly flavoursome and served simply with grilled vegetables and perfect chips. No need to complicate matters when you have such wonderful ingredients. 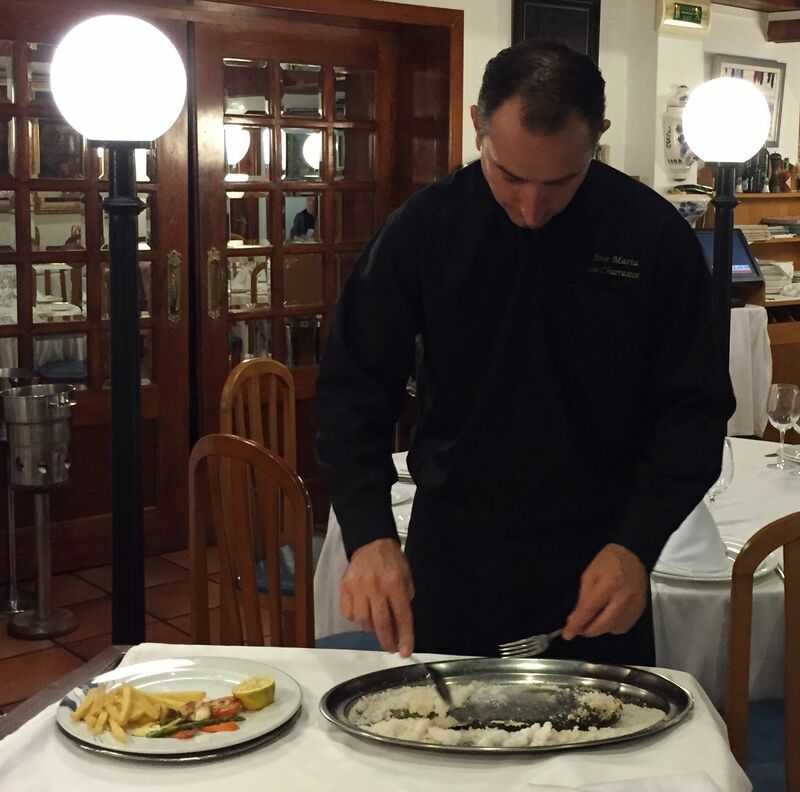 A Spanish classic always worth ordering is the fabulous lubina – sea bass. 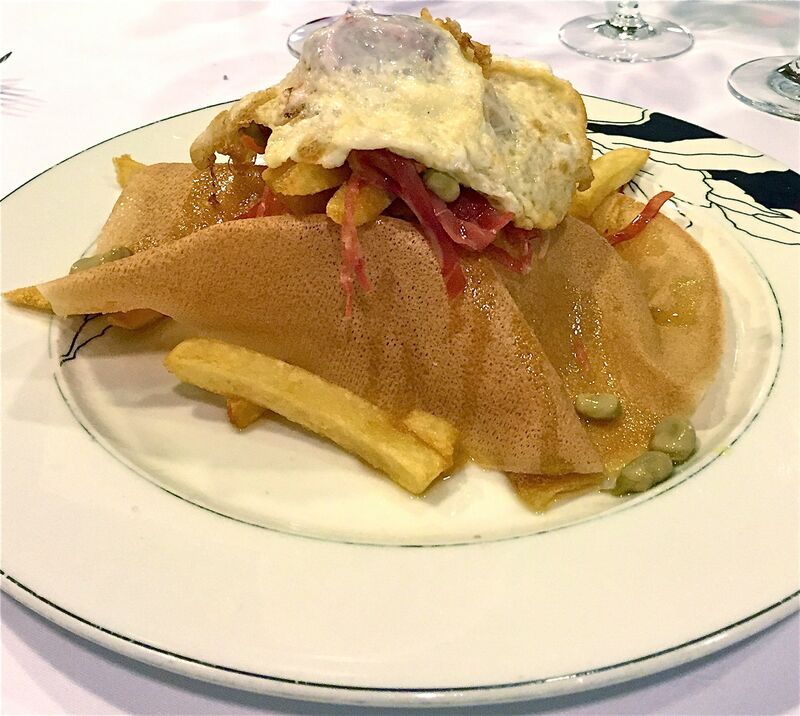 It is baked in the oven encased in salt and your waiter cracks the mound open and fillets it at your table. It’s a wonderfully sweet fish and the salt protects it from drying out, so you can be sure it’s moist and tasty. More pork…the restaurant is renowned for its suckling pig – Cochinillo Segoviano al Horno, al Estilo Jose Maria. 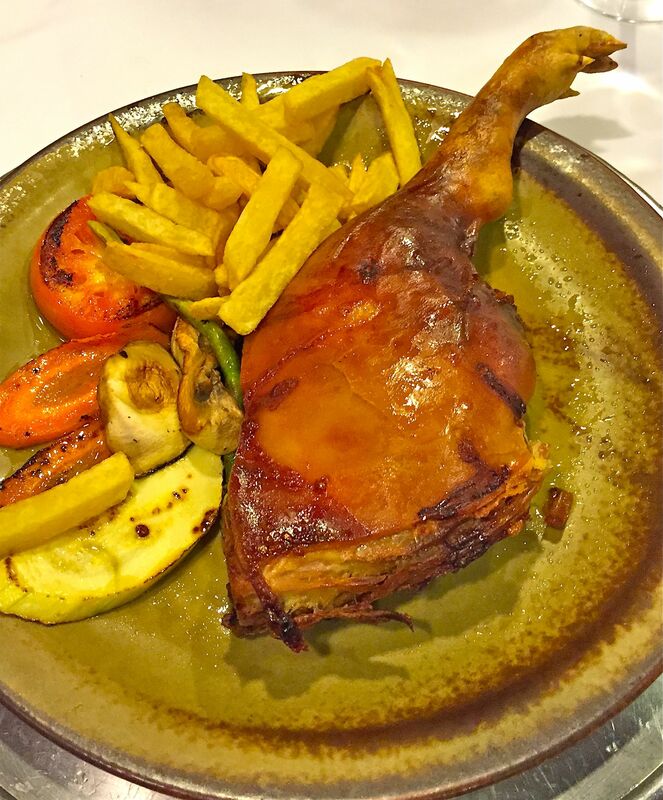 This is a large portion of meat with thin, beautifully crispy skin and again served simply with chips and grilled veggies. Flavoursome, soft and melt-in-the-mouth, it’s one of my absolute favourites. After such a feast it’s hard to contemplate dessert, but the menu sounded so tempting we couldn’t resist. 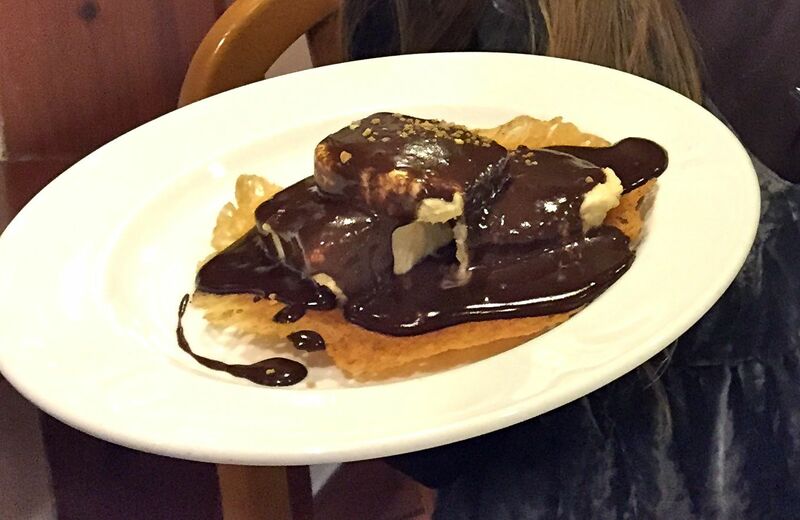 This almond ice cream is covered with rich Spanish chocolate…yum. I had to have the sorbette a limone con alcohol (lemon sorbet with alcohol) which is basically a zesty lemony cocktail served in a martini glass. The perfect way to finish off a meal that makes me feel lucky to be able to experience this wonderful Spanish cuisine in a traditional restaurant that always maintains the highest of standards. All without pretention, just thoroughly good food and friendly service. Jose Maria comes around to shake your hand every time…it seems he never has a day off. I’m already looking forward to my next visit. 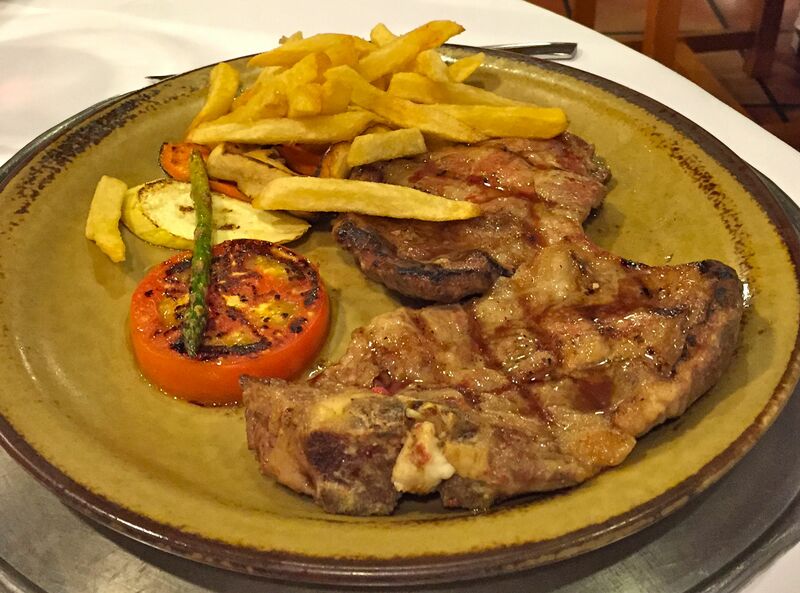 Jose Maria Los Churrascos is at Avenida Filipinas, El Algar in the province of Murcia, Spain.